The Stoneman Sports UL5A Sparehand Steel Adjustable Wheel Step fits large trucks and SUVs and attaches to the wheel well on most vehicles. 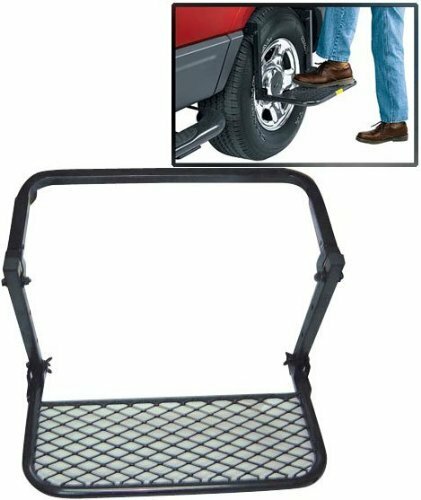 This step is made of sturdy steel and gives you access to the top of your vehicle to load and unload storage from your roof rack. This wheel step is perfect for truck owners who want to reach the center of their truck bed. This wheel step is constructed of steel and measures 37-inches by 13-inches by 18-inches with an adjustable height so you can reach the top of your truck or SUV. The Stoneman Sports UL5A Sparehand Steel Adjustable Wheel Step comes with a 1-year limited warranty to protect against defects in material and workmanship. Stoneman Sports is dedicated to innovation and simplicity and specializes in high-quality lifestyle and sports products. Their expansive product offering includes bike racks, kayak carriers, grilling accessories and much more. Stoneman Sports provides some of the most durable sports accessories at competitive prices and has great ideas for real-life applications.